A recent winter storm dropped new powdery snow over southern Vermont followed by an arctic chill that guaranteed it will stay around for a while! In contrast to the first two paintings of my winter series – “The Beginning“, and “Christmas Eve Morning” – there is deep snow cover over nearly all of this scene. 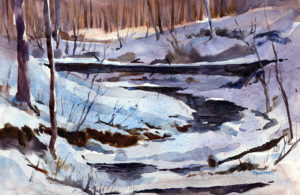 On cloudy, gray days when the snow lays deep on the ground, I often seek out streams and rivers knowing that there will be great contrast between the dark water and dark trunks of trees against the whites and lights of snow. This scene appeared along Fowler Way in Pownal, Vermont. The stream lay so far in the woods that this spot is probably not visible in summer from my vantage point in my car on Fowler Way. Overcast sky and sheltering trees kept the scene shaded revealing subtle grays and blues in the snow cover. Much of my work is concerned with subtle contrasts of temperature and intensity. In this winterscape painting, the color in the middle ground snowbank is both cool and relatively high intensity. In contrast, most of the snow covered area is covered with a warm, but lower-intensity violet blue gray. In addition, the distant woods seem to be catching just a bit of light which makes them slightly warm looking – especially when compared to the snow covered areas. Using low-intensity color, rather than neutral grays, for snow in shade is a way to provide vibrancy and interest in the snow-covered winter landscape. "It is my great privilege to sell most of my paintings direct to my collectors - many of whom purchase online." Purchasing direct, online helps me because it saves the cost of framing, transport, inventory, promotion and gallery commissions. In return, you get a really good deal on a piece of original artwork. - if it doesn't match the drapes, there is a money-back guarantee!